I love my crock pot. Do you? Crock pot meals are so easy. Throw everything in, turn on and walk away. I try to make everything I can in the crock pot. Especially soups. This black bean soup is no exception. I already have a white bean soup on the blog, so I thought it was about time to add a crock pot black bean soup to the mix. I just love the way a slow cooker brings out so much flavor in soup. This slow cooker black bean soup has a very small list of ingredients, but it’s so flavorful. 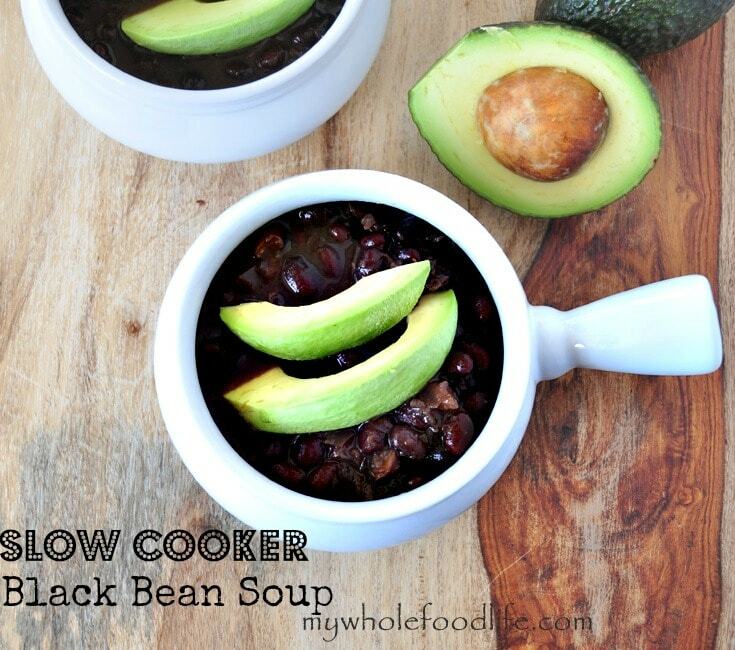 I highly suggest topping this black bean soup with some avocado like a did in the picture. Delish! An easy one pot meal your family will love! Put all ingredients in the crock pot . Cook on high for the first hour. After the first hour, turn down to low and continue to cook for 3-4 hours. If you want to cook the soup in less time, you can keep it on high. However, I think the longer a soup cooks, the better the flavor gets. If you are using dried beans, there is no need to boil them prior to using if you plan to cook the soup all day. If you want to cook the soup in a short amount of time, you will need to boil the beans first. That will ensure they get soft enough. Enjoy! Made this one last night and it was extremely tasty. Your Red Lentil Soup is still my favorite, but this one is a very close second. As a full-time employee and full-time nursing student I absolutely love love easy crockpot recipes. I loved this one and I also squeezed some fresh lime on top it was great! Could you use canned black beans instead? Is it necessary to drain the canned black beans for the soup?